The starters for the Braves series are up on the Phillies site. Nola, Pivetta, and Arrieta. Pivetta has looked really good in Spring, I’m excited!!! Julio Teheran is the opening day starter for the Braves. 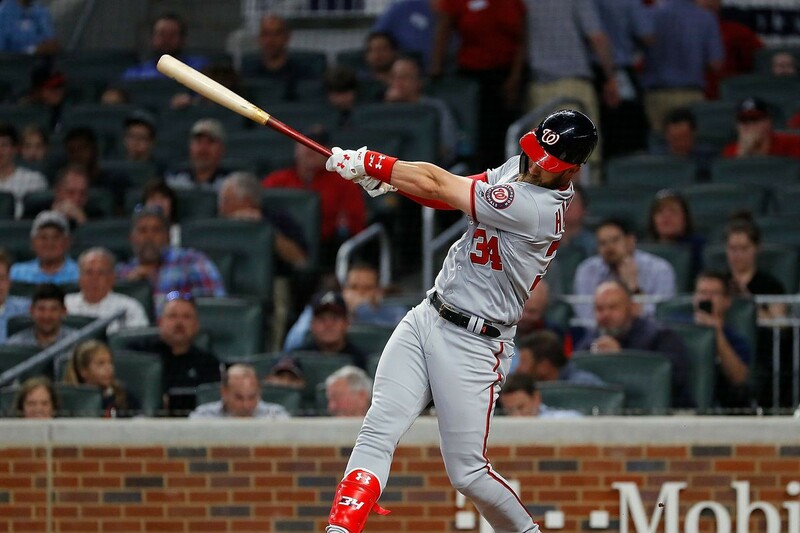 Harper has hit more home runs (8) off him than any other pitcher. Teheran has given up more home runs to Harper than any other batter. Harpers stats against Teheran are huge. See the batter vs. pitcher matchup for Atlanta Braves starting pitcher Julio Teheran on ESPN.com. Sometimes a hitter just had your number, which leads to a random thought by Seth. Thats likely your first four batters on opening day and they all hit Teheran well. So naturally hell get a CGSO. According to this sentient thumb who happens to also be a Braves beat writer the Braves will be starting a couple of rookies vs the Phillies as they are right handers. Makes sense but should be positive for Harper and Odúbel. The Harper choice over Machado was in part due to the lineup being so right-handed heavy, especially with regards to power. Harper will get walked a lot regardless. Hoskins, Cutch, Franco, Realmuto, Segura all right-handed. Agreed. Its why I'd like to see Hernandez Harper and Odúbel split up in the batting order. We don't have a lot of lefties, it would be foolish to bat one of our only two lefties next to our only switch hitter. I'm sure that will sort itself out over time. Well, Harper will bat 3rd, Herrera probably 6th. Hernandez could move to 8th, to avoid back-to-back lefties. Assuming what appears to be the lineup, that would give you R-R-L-R-R-L-R-S-P.
Thats McCutchen, Segura, Harper, Hoskins, Realmuto, Herrera, Franco (Kingery), Hernandez, pitcher. There are probably some arguments to put Cesar in the 1 or 2 spots against some RH pitching. We can also plan Knapp and Williams' occasional starts for Realmuto and McCutchen against right-handers who have more trouble with left-handed hitters. The lineup is not a problem now. It is just natural for other teams to try to skip their left-handed starters against us if they can. Its incredible how much better the lineup looks this year. Even guys who have been unreliable in the past seem much stronger further down the order. If I was building a lineup and I knew the batters would not care what order they hit in then I'd go with the following but the difference is probably pretty small and so it probably makes more sense to bat the players where they are comfortable and to keep the order stable from game to game. I get the impression Franco will bat 8th and we will see Hernandez and Herrera in the 6th and 7th spot. It sounded like Hernandez would rather hit low in the order consistently than split his time between lead-off and elsewhere. But, y'know, a player can get used to that too if he knows when to expect it. It also sounds like Kingery will get his looks at 3B, perhaps with the ground ball pitchers? If this is the Herrera we get this season I really like him in the 5 hole breaking up the righties. If we get the Herrera from the first part of last season all year long he would be a viable MVP candidate. Has the team been talking to Realmuto at all about an extension? If they are thinking about extending him, now would be a good time to catch a lower AAV (as he is making $5.9 million this year). Maybe give him $12 million next year and buy out 3 years of free agency at $15 million a year? $63 million total over 5 years. Catchers are not getting huge long term deals any more. Something like this could be a good long term play for the Phillies if they are sure about Realmuto, who probably knows any catcher is an injury away from not getting a decent contract. Maybe the Phillies would have to go a bit higher (apparently he turned down 5/61 from the Marlins), but I don't know how much higher. Catchers are just not getting $20 million long term these days (Posey is at $18.4 AAV). I think Realmuto will get something more like 20 mil a season. In an ideal world I think they would want to lock him up for the next 5 years. If he gets really good by the time he’s a free agent then I think a team will have to buy later free agent years they really don’t want to. You've got think they've thought about it but the one difference between him and all the other extensions is those players have actually appeared in a game for their team. It's possible both sides want to give it a year, even with the benefit to both sides (the AAV for the Phillies the security for JTR). Phillies getting some national TV exposure the first week. ESPN+ just added the opener to its schedule. Games 2 and 3 against the Braves are on FS1 and ESPN respectively and MLB network has the 2 Nationals games. ESPN+ games are still on MLB.TV right? Yes, they are not exclusive. I think they pick one game a day from the MLB.TV package and re-broadcast it. I dropped the MLB package this year. Just did not watch it enough but I had ESPN+ grandfathered for free so between that, national games, and the 19 Nationals games (living in DC) I will get, I bet I get close to half the Phillies games this year. MLB Network looks like they have a half dozen games a week in addition to ESPN, FS1, and TBS. 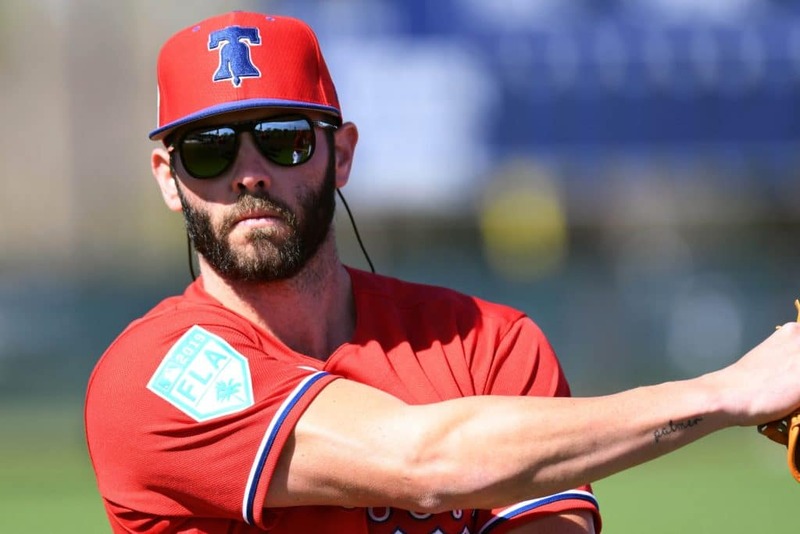 Encouraging article here on Arrieta. Biggest point is that his arm slot had changed since his peak years and he was getting less movement on his pitches as a result. Going back to the old arm slot in Spring Training returned the movement to his pitches, especially his sinker. And this is movement that is measured by all the new technology, so hopefully not just a wishful thinking Spring Training article. That's hilarious, tbh. Who do you suppose these alleged Phillies "baseball people" were who didn't want him, considering Klentak isn't even the guy who brought him into the organization? This sounds like a scout who isn't going to have his job for much longer (not because of this, just because he sounds like the type of scout new GMs and analytics-minded front offices won't want anymore). From what I understand, it was a controversial signing internally, because none of their baseball people could stomach him, but Matt Klentak liked him because he’s a likable goofball kid. They version that's now on the site got rid of the bleeped profanity, the "dog" and the unverifiable gossip.